Soundbars provide you with a happy medium between a cluttered multi-speaker set-up, and an upgrade on your TV's speakers, which don't necessarily offer the best sound quality available. If you want to get the best out of your home media set-up, then you'll need to invest in a soundbar or surround sound system to bring your TV shows and movies to life. With TV panels getting thinner and thinner, it's often the sound quality that suffers in favor of ever more detailed and vibrant pictures. No big deal - you can easily augment your sound. If you're looking to invest in a 4K TV to go with your new soundbar, you should familiarise yourself with our guide on how to buy 4K TV before checking out our pick of the best 4K TVs for under $500 as well as the best 4K TV for gaming, best gaming TVs, and best gaming sound systems. But for now, let's dive into our top picks for soundbars movies and TV. The Q Acoustic M2 isn't technically a soundbar, but the sturdy sound base can comfortably support a TV weighing up to 25kg. It's sleek, compact, and offers a number of inputs. It even has Bluetooth support, making it perfect for listening to music as well as for giving your TV and movies an oopmh when it comes to audio. The best feature of the M2 is the 180-degree sound technology, that makes the whole room the 'sweet spot'. You don't need to be directly in front of the sound base to get the optimum sound. The 58mm mid-high BMR drivers are complemented with a down-firing subwoofer to take care of the bass, making for a balanced sound. If you really want to ramp things up, you can turn on the MoviEQ setting for some beefed up bass for that home cinema sound. The Philips Fidelio B5 bridges the gap between a soundbar and a surround set up, with detachable rear wireless speakers to create “Surround on Demand,” taking your setup from 2.1 to 4.1. What's more, the rear speakers utilise a spatial calibration function to create the perfect sound balance, no matter where you place them in the room. Another big draw is Philips' Crystal Clear Sound, which just means that the sound source of whatever you're watching has been reproduced, letting you hear it as the creators intended. Those rear speakers can also function separately to the soundbar, and independently of one another, effectively giving you three speakers, with two of those being portable that you can place anywhere in the house. The wireless 6.5-inch subwoofer is a little on the tall side, but it's narrow enough to be tucked away somewhere discrete. If you want a surround sound setup, with none of the faff, this is the soundbar for you. Another sound base makes the soundbar list, with Sonos' Playbase. Large, but with a sleek and simple design, the Playbase is available in white or black, and can take up to 35kg of weight. Despite the lack of a sub woofer, there's a pleasantly surprising amount of bass. You'll find 10 amplified speaker drivers inside; six mid-range, three tweeters, and one woofer, and you can tweak the bass, treble, and loudness to your personal taste. For the sake of simplicity, Sonos has pared down the inputs to a single optical, and the wireless connection is WiFi only. Ideally, the Playbase is designed to integrate with the family of other Sonos devices, but the sound is robust enough that this isn't a necessity. The speaker doesn't have a remote, and is controlled with the Sonos Controller App, which lets you stream music directly to the device from most streaming services. If a minimal aesthetic and a fuss-free set-up that you can expand on as-and-when you want is your cup of tea, the Sonos Playbase will happily oblige. The Sony HT-ST5000 Soundbar is a little on the steep side when it comes to price, but it offers high-end that will make you feel somewhat better about blowing £1200 on a soundbar that doesn't offer surround sound. A slim build houses seven 65mm drivers, with the centre, far left, and far right drivers benefiting from centrally mounted tweeters. Two up-firing Atmos drivers also sit on either end, and this is all rounded out with a rather hefty wireless subwoofer housing a 12 x 8-inch passive radiator and forward-facing driver. The selling-point is Sony's 7.1.2ch S-Force PRO Front Surround technology which "emulates a natural, three-dimensional sound field." The setup menu allows for further fine-tuning, letting you input your distance from the speaker, and the ceiling height, which the Atmos relies on to create that 3-D sound. If you have the money to spare, value sound quality, but want to keep your living room as uncluttered as possible, you can't go wrong with the Sony HT-ST5000 Soundbar. Designed for use with TV screens measuring 55" and above, the Samsung HW-N950 is a part of the manufacturer's Cinematic range, and it delivers on high quality, immersive sound thanks to Dolby Atmos and DTS:X. 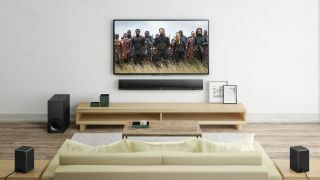 The soundbar houses three front-facing speakers, left and right side-firing speakers, and two upward firing drivers, in addition to the bass-reflex design wireless subwoofer. The soundbar can be set up and controlled using Samsung's SmartThings app, but it also features Alexa support, giving you a wider range of control options. It delivers on both clarity and bass, and is truly one of the best soundbars on the market.